Here is a small sampling of the usual questions we receive from guest. If there is something that is not answered here, please leave a questions in the comments. We’ll reply as soon as possible. When is Yee Peng this year? What is the difference between these events and the festivities in the city? The events are synchronized mass lantern releases. 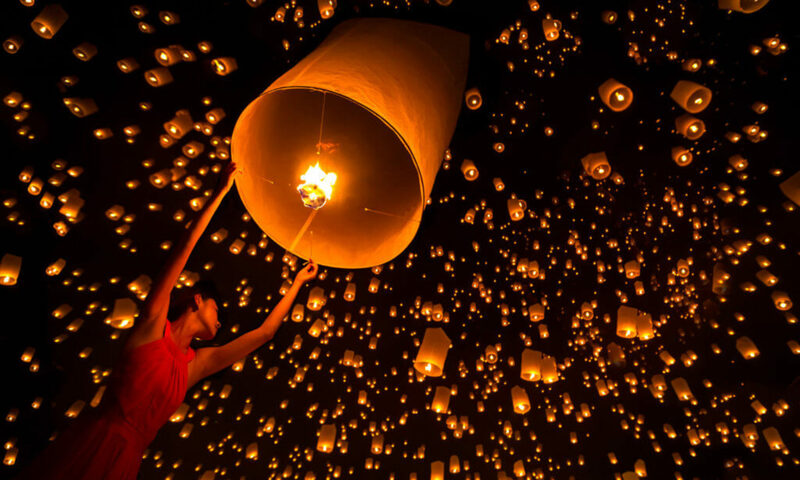 All those pictures with thousands of lanterns in the sky are at these events. You will see lanterns in the city, but nothing like in the pictures! There are 2 mass lantern releases events? When do you start selling tickets? As soon as they are available. YeePengLanternFestival.com has always been the first to announce tickets once they are available. We generally expect tickets for both event to be available by late April or May. There are different events with different seating “levels” Check the YeePengLanternFestival.com homepage for links to each event. In the past, we have made arrangements for YPLI tickets to be delivered to your hotel and a “will-call” system for the Doi Saket event. We are considering a “will-call” system for both events this year. Your tickets will be registered by name/passport number. You receive them as you board the transport vans/buses. This event is based on a traditional holiday. As a general rule, please keep the knees and shoulders(and everything in-between) covered. Both events prefer the minimum age of 12 yrs old. If you choose to bring your child, you are fully responsible for them. Is hotel/hostel included in the price? No, but we can help you find the perfect place. Let us know if you would like help. Is food included in the ticket? All YPLI tickets include food in the ticket price. The Doi Saket event provides food for VIP tickets only, but has merchants available for those who want to purchase local Thai food at the event. Yes, all tickets purchased from YeePengLanternFestival.com include trasnportation from the city to the event and back to the city. The pick up points are announced in October. They are always inside the city area so its easy for everyone to get to. What time should be arrive at the pick up point? Can I self drive or take a private taxi? Yes, but it would be A LOT of work. You would need to pick up your ticket at our transport location, and then drive an hour out of town to the specific location. Your car/tax will not be allowed into the event area. You will need figure out how to contact them after the event to get back to the city. We have helped many people over the years you had flights landing on the day of the event. If this is the case, please contact us directly and we will try to help. Can we go to both events? No, they are held at the same time/day. Yes, lanterns are provided. Some levels of tickets get 1 lantern, some will receive 2. Can we bring our own lanterns? No, both events have stict policies against outside lanterns. As they come in many size and different quality, outside lanterns will not be allowed into either event. Can you suggest a good hotel near the event? Yes, but we won’t. There is nothing out there other than the event itself and transportation is included from the city. We advise to stay in the city. Can you help arrange tours? Yes, we still arrange private and group tours through CMStay. Just ask and we’ll help arrange whatever you need.